Become a City of Lakes Sponsor! 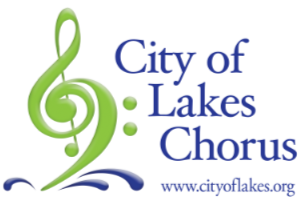 The City of Lakes Chorus is dedicated to bringing exciting four-part a cappella harmony to our audiences through entertaining, energetic performances. The success of our endeavors is credited not only to the 90+ women who regularly rehearse and perform with the group, but also largely to our sponsors who lend their names and financial support. A City of Lakes sponsor helps us provide high quality, family entertainment and preserve the barbershop music art form. Your sponsorship helps women realize their potential through education, growth opportunities, harmony and friendship. Your organization will also benefit with the extended exposure from promotional efforts directed to the supporters of our music. We have several levels of sponsorship packages, as detailed below. You may select the level of participation that best meets your needs. Be secure in the knowledge that your sponsorship fee will be used to help City of Lakes fund performances and education in the community. As they perform and compete beyond the bounds of their locale, they also advance the art form at the international level. We welcome your support at any level and highly value your generous backing of City of Lakes. To become a sponsor, simply click DONATE below.